There are days, for a lot of folks, when you enjoy your job more than others. Today is a day when I really enjoy my job because of my guest and his recent Slideshare he published. and what a fun yet learning experience his Slideshare turned out to be. 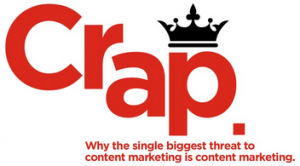 The name of the SlideShare is: ‘CRAP: THE SINGLE BIGGEST THREAT TO B2B CONTENT MARKETING’ and we feature Part One of our discussion today with Doug Kessler on your ‘A Slice A Day’.